While freedom may not immediately come to mind when thinking of transportation, the value is really at the heart of what a successful transportation system offers: the ability to pursue opportunity. Whether that’s get to a job interview on time, visit a loved one, get kids to school or explore new places, a public transit network is the backbone of delivering that freedom for everyone in a region to live fully. Delivering freedom is key to supporting growth that is inclusive, and nowhere is that more critical than in a region growing as fast as Orlando. The Orlando metropolitan area is one of the fastest growing in the country, adding close to 1,500 people per week. By 2030 our region is projected to reach a population of 5.2 million people, with potentially 600,000 more personal vehicles traveling on Interstate 4. Add that to the over 57 million people flying into and out of the region each year. All of these projections beg the question: How can the Orlando region best leverage its public transportation systems? Jarrett Walker has a few ideas. 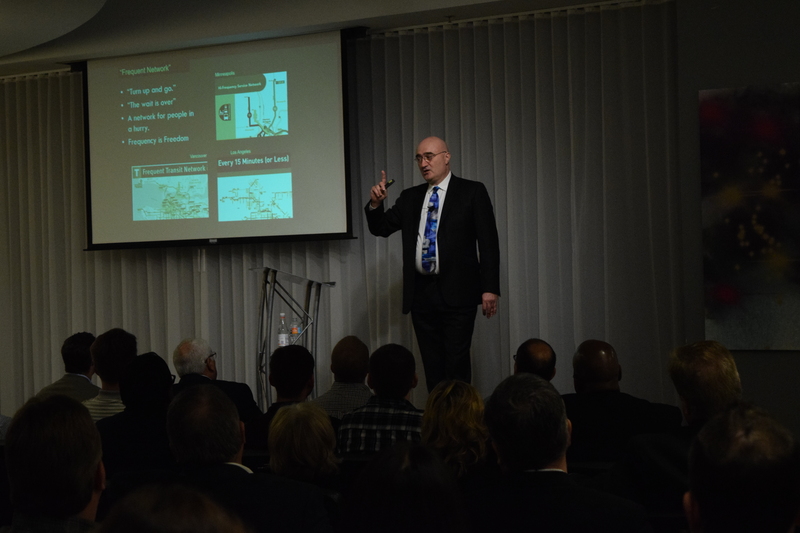 Walker was invited by the Partnership’s Alliance for Regional Transportation Consultant Jim Hartmann to present a deep dive into the impact of public transportation on quality of live. Here are his recommendations for Orlando regional transit including calling on a coalition of community leaders and organizations to expand the options for public transit and its frequency. Q: Can you explain your unique view on public transportation? A: When we talk about public transit, there’s a tendency for people to talk too much about vehicles, technologies and products but not enough about the basic geometry of how you build a public transit network and how public transit services fit together to create freedom and opportunity for everyone. I really want to bring the conversation back to the concept of freedom, but first of all, the reason we talk about transportation at all is that people want to have choices in their lives. That means choices about where they can go because where you can go is what you can do. So, I’m really bringing it back to what it means to design rail services and bus services to all work together so that you can measurably make it easier for people to go more places and do more things. That’s how transit succeeds, when it succeeds at that. Q: What is your take on what you see happening in Orlando? A: Well, I rode SunRail yesterday, rode one of your bus lines going to North Mills Avenue, and I had a look at your transit center, which is magnificent. What I saw was, first of all, you’ve got a really nice bus fleet, which is a huge advantage; lots of transit agencies are running 15-year-old buses that really show. You’ve got a nice fleet that looks good. That’s a huge benefit to start with. SunRail is a nice experience, but given the short distances it serves, it’s not nearly frequent enough. You’re going to have to rethink what kind of technology you use there and in particular what kind of staffing it requires because if you have too many employees on a train, you can’t afford to run the trains often enough. And if you can’t run the trains often enough, it’s really not useful. If you’re just going, say, from Orlando to Winter Park, you’re not going to wait an hour to go from Orlando to Winter Park. You need more frequency than that. So, there’s some really hard decisions to be made about what you want SunRail to be. Do you want it to just be a few trains on rush hour for commuters? It looks like you’ve got a line that could support 15 minute frequency all day if you could figure out how to run that. You have towns. There are reasons to go to many of these towns all day; it’s not just a commuter thing. Q: As an organization, we can see how that will evolve given the fact that we will have a downtown campus opening and we continue to grow our population by almost 1,500 new residents a week. So, do you think that the recipe is there for Orlando to come up with a strategy that would work? A: I think almost everyone can if they stop and think about it: okay, 1,500 new residents a week, for example. Do you really want 1,500 new cars a week? You won’t have room. It’s not possible, and that’s going to show up in a loss of freedom for people as they spend more time sitting in traffic. There have to be alternatives, and they have to be attractive. They don’t have to be attractive to everyone. I don’t need a very fortunate person who really likes his BMW— I don’t need to convince him to leave his BMW in the driveway. But the point is, plenty of people will leave their cars in the driveway or not buy an extra car if transit is useful for them. You really need to precision engineer. It’s very important that we design transit for the middle 80 percent, and not necessarily for the elite, but that it be good and functional and decent and civilized. We know how to do that. It will take more money, but it’s really possible here to have a transit system that actually works for a lot more people. That’s the only way the city will function if it’s growing as fast as it’s growing. Q: What do you think are some of the key ingredients for a community to make some progress in their transportation planning? Is it government relations, community buy-in? What is the combination that is needed to transform cities? A: It’s all of those. You know, the first thing you have to understand is that transit is actually massively popular right now. In November 2016, there was almost a clean-sweep of transit measures across the country. You have to run them with high turnout elections, of course; in a high turnout election like a presidential election, we have tremendous success with getting voters to support more money for transit and to pay more money for transit. Transit is not trying to be profitable. It’s trying to be essential infrastructure for a city that is too dense for everyone to drive. It’s very important to be clear. When we’re talking about essential infrastructure, we don’t expect it to be profitable. We know we’ll have to pay for it, but people are increasingly understanding that you can’t run a growing city like Orlando exclusively on car dependence. There simply isn’t room for all those cars. So, people are understanding that and, as a result, we’re seeing so much success because we know you still have to do the political work. You still have to bring together the business community and the social service community and the people who reform civil rights issues and make sure that you’ve got something that all those communities appreciate. But we’re seeing more and more success with it, and it’s a really good time for moving toward a really good and useful transit system.